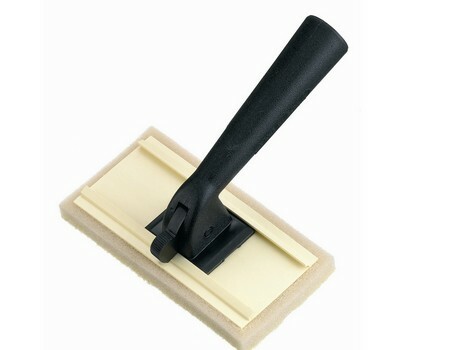 A paint pad has a handle, a backing plate, a thin layer of foam and a flat pad of mohair pile which is used to apply the paint. A wide range of sizes and handle styles is available. Standard pads are flat and rectangular and they vary in size from about 50 x 60mm to around 225 x 100mm. Sometimes pads are sold in sets with a special tray. Pad trays are generally narrower and deeper than roller trays and do not have sloping bases. They also have distinct lips for scraping the pads over to get rid of excess paint. 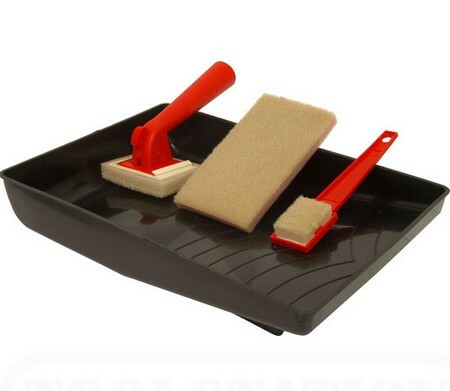 Some pad trays have grooved loading rollers in them: you brush the pad over these to pick up paint. To use a pad, you dip the pile into the paint and draw the pad across whatever you are painting. Large pads are designed for use with emulsion paint and small pads are more useful for applying gloss or other oil-based paints. Sometimes replacement pads which lit on to the backing plate can be bought. This saves you having to buy a whole new one or a whole new set when the pad wears out. In general, pads are tiring to use and tend to leave a disappointing finish with gloss paint. However, they are particularly splash-free. Recharging a pad can be quite tricky the pile, not the foam, should be dipped into the paint. As the pile is generally only 6mm thick, you have-to be quite accurate, even when using trays with loading rollers. As well as the normal rectangular pads, you can get touch-up or sash pads which are useful for getting into awkward places, and pads with handles which will take a broomstick.